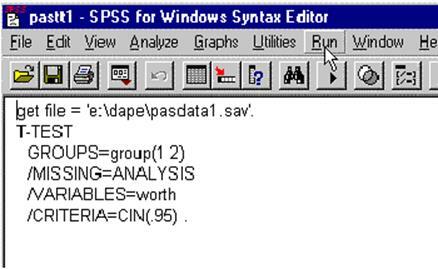 Your SPSS window should look something like the following. 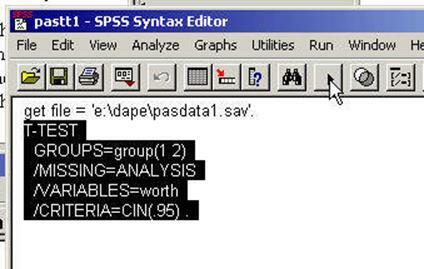 There are two methods of submitting or running the SPSS programs. To run the program, the text within the Window must be "selected." That is done by placing the cursor in the upper left hand corner of the Window, just before the first word of the file and pressing the left hand mouse button (holding it down) and pulling the cursor to the bottom of the Window. This will result in the background becoming dark and the foreground becoming light. Then click on the right delta as indicated in the next graphic. Click on the button as indicated by the arrow in the above figure. 3. Click on "Save Data"
A pull-down window will appear as in the next graphic. Click All as indicated.